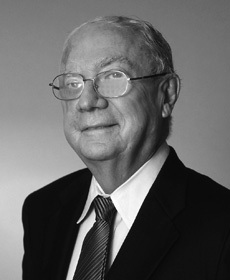 Our friend, our colleague, and our Chairman, William F. Harrington, passed away at the age of 78 in January, 2010. “BJ” Harrington joined the Firm in 1959, where he practiced law for 51 years and served as our Chairman and Managing Partner for 35 years. He was an accomplished attorney in trust and estate litigation and oversaw the growth of Bleakley Platt into one of the premier law firms in the region. He also served as Legislative Counsel to Lt. Governor Malcolm Wilson between 1964 and 1973, as Town Attorney for the Town of Pound Ridge from 1980 to 1985, and Town Justice for the Town of Pound Ridge between 1985 and 1991. BJ received a degree in accounting from Manhattan College in 1953 and his law degree from Fordham University School of Law in 1959. BJ also served on the Board of Directors of his beloved Fordham Law School, where he was instrumental in the creation of the Cardinal John O’Connor Chair for Theological Studies. He also served as a founding member of the Boards of Directors of Pace Law School and The Ave Maria School of Law. He also served as a member of the Board of Directors of Sacred Heart High School, Iona Preparatory School and the School of The Holy Child. At the time of his death, BJ was the moving force behind the construction of the new Elizabeth Seton Pediatric Hospital in Yonkers, serving as the Hospital’s Capital Campaign Chairman. BJ was a Knight of Malta, a Knight of the Order of St. Gregory the Great, and humbly accepted various awards throughout his life including the St. Thomas More Award, The Fordham Law School Medal of Achievement, the Charles Carroll Award from the Catholic Guild of Lawyers, the Cardinal’s Committee of Laity Award, the Pro Eccelesia Et Pontifice Medal and the Humanitarian Award for Life. In addition, BJ proudly served as Grand Marshal for the Yonkers’ St. Patrick’s Day Parade. It was a great honor and privilege to have known and worked with BJ. He was a very dear friend and dedicated colleague. He is deeply missed.